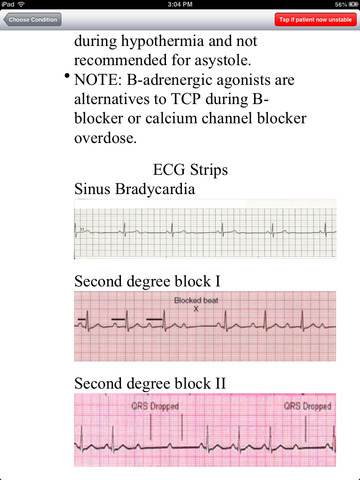 This is the fastest utility for managing and preparing for ACLS. Unlike other apps that present algorithm sheets, this smart utility guides you to the pertinent therapy by asking one to two questions. 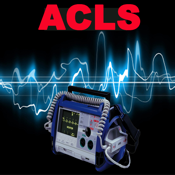 ACLS Fast gives you all the rhythms and arrhythmias along with the specific treatments. You also have acute coronary and stroke syndrome management. In addition, there is a two minute timer to assist you with time management during a code. 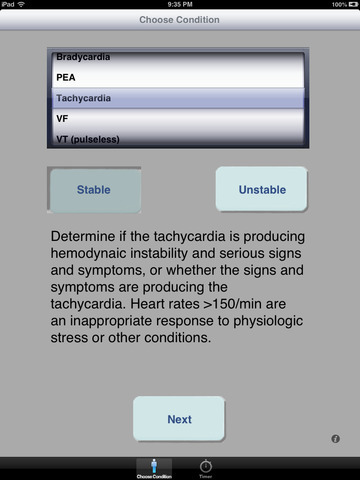 Now you don't have to second guess when two minutes pass and it is time to recheck vitals and shock. Every two minutes a loud alarm activates. The timer is resettable. Need to start inotropes, but you can't remember the right ones? This app has it and it is fast! Finally, you can take an interactive exam. There are many multiple-choice questions from which you can choose. Use this to test your knowledge or sharpen your ability to take care of patients. You can use the app in the field and hospital for rapid diagnosis and treatment. You can also use it as a quick, comprehensive study tool. Either way, nothing is this fast or simple. Also, check out PALS Fast for pediatrics.